Rafael Nadal has just won the Australian Open in an epic 5 sets final, defeating Roger Federer 7-5 3-6 7-6 (7-3) 3-6 6-2 to secure his first hard-court grand slam title and prevent the Swiss equaling the all-time Majors record. 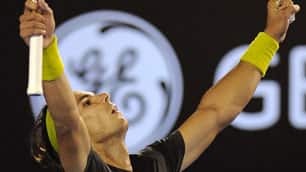 It's unbelievable how the world No,1 recovered from his five-hour semi-final against Fernando Verdasco (less than 48 hours) to claim his fifth successive victory against the No.2 seed. Federer remains on 13 grand slams, one behind Pete Sampras, and with an enduring mental block against the Spaniard, who has now beaten him in their past three grand slam finals.